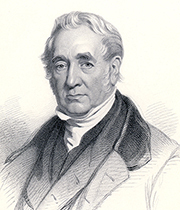 In 1836, at the time of the Rainhill Trials, maverick author and lecturer Dr Dionysius Lardner (1793-1859) referred to George Stephenson in a public lecture on steam engines as 'father of the locomotive'. This was the beginning of a high level of recognition for Stephenson, but also some confusion, not helped by his early biographer Samuel Smiles. Stephenson was in partnership with his son Robert, principal designer of the well known steam locomotive Rocket, who became famous in his own right. A certain amount of misinformation resulted from the confusion between their names. However, George Stephenson's achievements were many and world-changing. 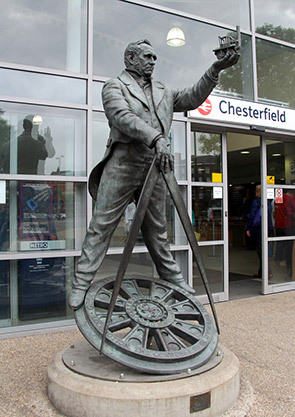 The later epithet 'father of railways' (coined by John Uniacke, chairman of Chester & Crewe Railway, in 1839) is perhaps more fitting for him. He did not invent the steam engine. But he did realise that steam locomotion could and would change the world by making the transport of materials and people easier, faster and cheaper. Doggedly determined and fiercely proud, he led the way in making it happen. As his later biographer Hunter Davies (b.1936) put it, "Would railways have arrived without Stephenson? Probably ... but he was the single most important element ... Railways affected everything. People lived differently, worked differently, ate differently, had holidays differently. Suburbs were created because people no longer needed to live on top of their work[place] ... people were brought nearer to each other, the world began to shrink". Outgoing and friendly, Stephenson had simple tastes, hating pomposity and pretentiousness. He never lost his Geordie accent, despite working closely with people of all social levels and from all parts of the country. 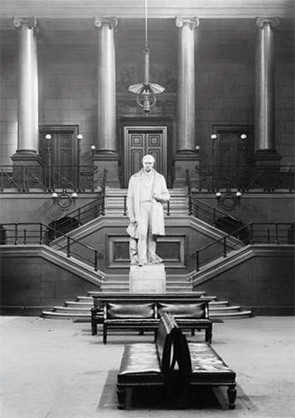 It can be said that his accent counted against him — he was derided for it when he spoke before Parliament concerning the Liverpool & Manchester Railway. But he was not easily intimidated, and was never shy of championing his opinions over those of others. Despite his lack of formal education, Stephenson was welcomed into the mechanical engineering fraternity, particularly in the north east and the Midlands. Yet there remained a certain bitterness — even jealousy — between him and the influential civil engineers of the time, who were mostly based in London. Though invited to become a Fellow of the Royal Society and the Institution of Civil Engineers, he declined both, apparently seeing no advantage in joining. However, he is proudly remembered by the Institution of Mechanical Engineers as one of the founders and their first President. As L.T.C. Rolt writes: "Although George Stephenson had felt in his younger days, unreasonably at times, that every man's hand was against him, yet he was one of those few fortunate pioneers who lived to enjoy both wealth and honour". His achievements are impressive: the building of the first permanent public steam-powered railway in the world, and the first inter-city railway — along with the design and construction of many famous steam engines and groundbreaking railway infrastructure of the sort that we now take for granted. No wonder he was something of a legend in the North, and is widely appreciated today. The Stephenson legacy is all around us, ingrained in every rail track. Perhaps the last word should go to his celebrated son, engineer Robert Stephenson (1803-59), who concluded his inaugural Presidential address (January 1856) to the Institution of Civil Engineers with: " ... all I know and all I have done, is primarily due to the Parent whose memory I cherish and revere".